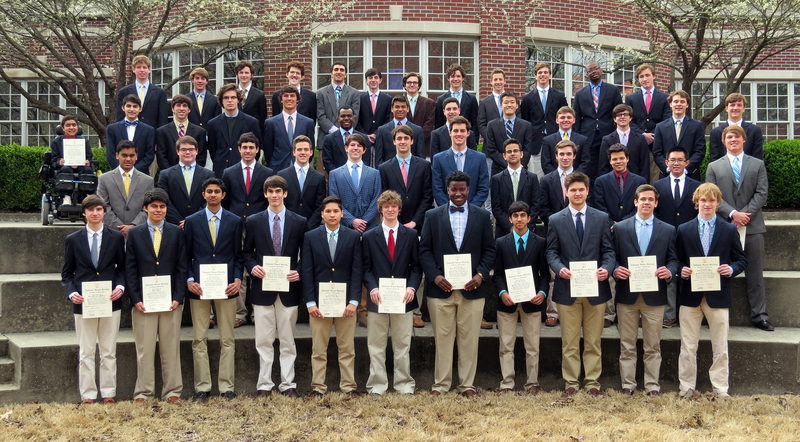 In a March 18 ceremony that highlighted the National Honor Society tenets of scholarship, leadership, character, and service, current members tapped 10 seniors and 40 juniors as inductees into the organization, which recognizes outstanding high school students. Following Headmaster Ellis Haguewood’s welcome, Dr. David Jackson, chairman of the Religion Department and head of the National Honor Society committee, introduced the four student speakers, all seniors, who lit candles representing the NHS characteristics. The ceremony continued with the tapping of new members and the presentation of certificates, while family members watched their sons receive their honors. Haguewood concluded the ceremony by commending the inductees and inviting them to a reception in their honor. To see photos from the ceremony and reception, click HERE.